Here is my melodeon, which has come to me on such a slim chain of events that clearly we are meant to be together. She is a D/G instrument of indeterminate age and history, and one sticky button, but I shall be researching her (and finding out how to unstick her). I want to be able to play with the Morris band, and I’ve started on the whistle, but I wanted something with a bit more oomph. I was going to have a bash at learning the concertina – a friend kindly lent me an English one, but it simply didn’t suit my hands, and I must return it to her. I’ve been keeping an eye out for an Anglo, but nothing decent at an affordable price has appeared on eBay, and really I wanted a melodeon, but similar applied. 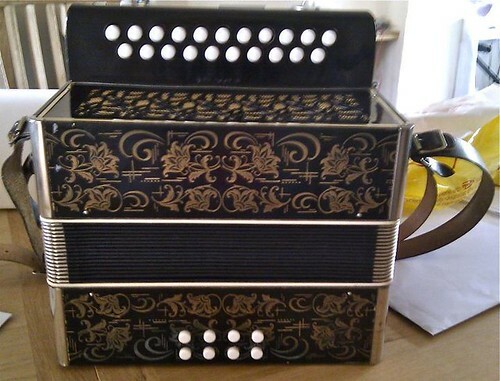 I mentioned this at Morris practice on Tuesday, and Joe said that there was a melodeon in Cash Converters in Selby; he’d had a look at it, it played well, and it was £135. *Ting*. We arranged that I would speak to Pete to see if I could have it (of course I could :), and Joe went back to have a look on Wednesday morning. Still there, and so he bought it, and I did a bank transfer immediately. Pete and I went to fetch her yesterday, and now I just have to learn to play her. Aargh – it is like nothing else I have ever played. My brain may explode. Still, I managed to get a scale out her last night, and she’ll come round, I’m sure. Currently she is known as Betsy, but this may not stick – we’ll see. But she is definitely a gurl. I have ordered her a gig bag this morning, and have also ordered up the one melodeon tutor located in the entire Hull Library system. Watch this space. And buy earplugs. Next Next post: to the west!